Portrait by artist Joey Nix, from his show at the Art Primo Showroom. 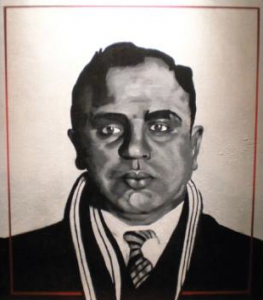 Down in Georgetown, muralist, canvas artist and former Beacon Hill resident Joey Nix is opening a show featuring portraits of mobsters, at the Art Primo Showroom at 6601 East Marginal Way South, Suite B on February 6. The show is from 5:00 to 9:00 pm, free, and open to all ages. Facebook now has a Beacon Hill Residents group. A “violent street gang claims Beacon Hill,” says the Rainier Valley Post, pointing out some gang tags on North Beacon Hill properties. Remember when T-Mobile applied last year to install three panel antennas on the roof of the Jefferson Park Apartments at the corner of South Spokane Street and Beacon Avenue South? The antennas are planned to be located “within a faux brick chimney shroud assembly… extending approximately 10 feet above the roof top.” The installation has been conditionally approved. Blogging Georgetown brings us news of a new grocery store at Carleton & Warsaw, rather closer for our west-slope Mid-Beacon Hill neighbors than Red Apple or Safeway, and perhaps worth a trip from further out. This is the second (and last) weekend of the Haunted Brew House Tour at the Rainier Cold Storage Brew-House, just down the hill in Georgetown. The 1903 brewery, once the sixth largest beer-producer in the world, will come to life with members of Ensemble Sub Masa and Annex Theatre bringing the spooky fun. Tickets and info here. The Brew-House is at 5900 Airport Way South. 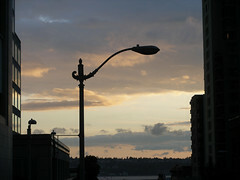 Downtown streetlight. Photo by iluvrhinestones. Beacon Bits are collections of useful or interesting links or other tidbits that we’ll post periodically. The Fourth Annual Georgetown Haunted History Tour is this weekend, October 24th and 25th, with two nights of four one-hour walking tours each. The Friends of Georgetown History promise “creepy stories, haunting theatrics and ghoulish music” for all. Ticket and other info may be found at this link. Costumes are encouraged. Sorry for the short notice, but right now Saturday at the Georgetown Morgue (soon to be the site of this year’s KUBE Haunted House), 5000 E. Marginal Way South, there’s a “scare-free” event for kids, with pumpkin decorating, costume contests, and so-on. It’s scheduled to run until 3:00 pm, so you still have time to get down there. It’s scheduled from 1:00 to 3:00 pm. Afterward, there’s always the Haunted House itself, which opens that evening. But that one won’t be scare-free. (They suggest it for ages 12 and up.) It won’t exactly be cheap, either; tickets are $10–$25. I don’t suppose anyone knows of any haunted houses up here on Beacon Hill — or perhaps in the Valley or Columbia City? If you do, fill us in on the details, please! Thanks, Seattle Weekly— but next time, why not put the date of the actual event on the web page, instead of the publish date?